If you are hosting a cocktail party, this may be the biggest question of the event. All of the other details like time, date, place, entertainment... those are easy! It is the fear of running out of drinks (and food) that gives hosts the most worry. So, How Many Drinks Per Guest? The other question for any host is: Will there be a full bar or a select cocktail menu? Decide which cocktails you will be offering. Determine the number of guests you can expect. Know how much of each liquor and mixer you need per drink. Use the tables in How Many Shots are in a Bottle to estimate how many bottles of each ingredient you will need. For the base spirits, add one extra bottle of each needed just in case (leftovers can go into your regular bar stock after the party). The full bar option is a little more complicated because you'll need a greater variety of liquor and mixers available so guests can order the drink they want. The following chart is an average bar stock based on the number of guests in attendance. Of course, you can choose to eliminate any of these ingredients based on your guests. For instance, if you know that you will not have many martini drinkers in the crowd, eliminate or reduce the vermouth. One great piece of advice: if the majority of people at the party are under 35 years old, increase the vodka, rum, and beer stock. One bottle of liquor in this chart refers to a standard 750 ml bottle. For some of the spirits, a recommended style is in parentheses—i.r. for rum, a white rum would be most universal. Whiskey in this case is rather generic. It's typically best to stock a second whiskey, other than bourbon, that will appeal to most of your guests. A Canadian or rye whiskey would be a great option for mixing the average 'whiskey' cocktail. If you think your guests are partial to Irish whiskey, stock a bottle or two of that as well. Choosing which liqueurs to stock is going to be a matter of personal choice. It would be best to begin with the essential and secondary liqueurs listed here. 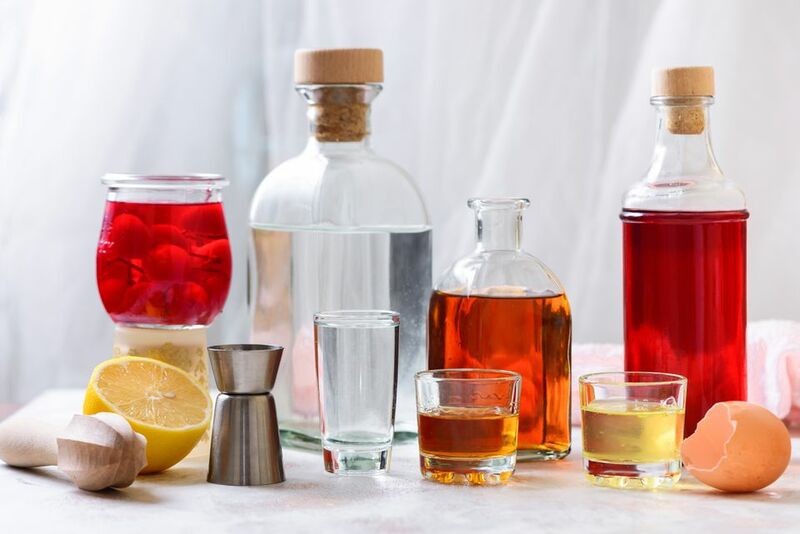 If there is a particular cocktail that you will be serving, be sure to stock any specialty liqueurs for that as well. Aperitifs may be a good optional bottle to stock, particularly if dinner will be served at the party. The most popular option would be Campari. Aperol would be another nice addition. Other Juices: Included in this would be any specialty juices that you may consider stocking. Options may include tomato, pomegranate, apple, or any other juice that may fit a particular cocktail offered. Stock a variety of beer. Offer at least two options and more if your guests are particularly fond of beer and could be considered connoisseurs. The wine recommendations assume about a 5-ounce pour per glass and 750 ml bottles. White wine is typically more popular than red. Garnishes are cheap so it is always best to overestimate. The other key to any great drink is ice. Plan on 1 pound of ice per person and you will have enough for mixing drinks as well as keeping beer and wine chilled. One last piece of advice that's vital to making everyone at the party happy: plan for and offer a great mocktail or two for guests that don't drink alcohol. What Are Some Gas Grill Cleaning Mistakes?